1. Before a student is admitted to the college, she or her guardian (if she is below 18 years of age) has to sign an undertaking in proper form to the effect that the student will abide by the rules of the college. 2. All applications of the students addressed to the Principal should be routed through the office before it is placed before the Principal. 3. Students should inform the office of the Principal about subsequent change of their home address. 4. No student shall be allowed to meet any outsiders in the college campus without the permission of the Principal. 5. No student shall be allowed to remain absent without leave application for more than 3 days continuously. Application for leave, duely signed by the father/guardian, must be made in advance to the Principal through proper channel. Absence due to illness needs a medical certificate duely signed by a Registered Medical Practitioner and the guardian. 6. Students of the college are forbidden to be associated with any outside Atheletic Club or Society without prior permission of the Principal. 7. 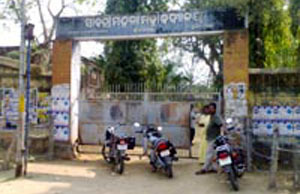 Students willing to go for study tour, excursion, picnic ousides Bhanjanagar must obtain prior permission of the Principal. 1. Usually the college re\opens during the 1st week of July every year after the Summer Vacation. The 2 nd year classes of +2 Arts & Science and the 2 nd year & 3 rd year classes of +3 Arts start from the very day of re-opening. First year classes of +2 Arts & Science and +3 Arts begin after the closing date of admission. On working days, classes start from 10.00 A.M. continue upto 4.00 P.M.
2. The office & Library of the college function from 10.00 A.M. to 4.30 P.M. on all working days unless otherwise notified. In case any of the dates fall on a holiday, the Principal will notify the date on which the monthly fee of that particular class will be collected. If a student is a defaulter consecutively for two months, her name will be struck off from the attendance register and Rs. 100/- will be taken as extra amount for re-entering her name in the attendance register. 4. Students may lodge any complain regarding official lapses and bring the matter to the notice of the principal in writing. However, the behavior of the student should be polite towards the employees of the college. 5. All application, i.e.,for issue of college Leaving Certificate, conduct certificate, Migration certificate, Bus concession etc., shall be addressed to the Principal. Normally college Leaving Certificate is issued on the second day of application. 6. Application for issue of T.C. & C.L.C. should be accompanied with clearance certificate and no dues certificate from all concerned depts., Account Section, Liabrary etc. 7. The college has introduced dress code for the students as per the instruction of the Govt. of Orissa. The students taking admission in this College must abide by the Dress Code. 1. Students are advised not to disfigure the walls, floors, pillars or doors and make them dirty. They must see that the campus is kept clean. Pasting placards, posters and other papers are strictly prohibited. 2. Students should attend the classes in time as per time table. 3. Misbehavior of a student in the class-room, in meetings, matches or in any other function is liable to be punished with a fine or expulsion or both as decided by the authority. 4. Any sort of coercive action of a student inside the college campus will be treated as an academic indiscipline and will be liable for punishment. 5. Students should appear all examinations conducted by the college from time to time. Wilful absence in any examination without obtaining prior permission from the Principal will be viewed seriously and is liable for punishment. 6. Students should invariably observe queue while waiting at the college counter or library. 7. No club or society be formed and no function be organised by the students in the college without the prior approval of the Principal.